It’s very important to understand that this is a serious maladaptive pattern of behavior. It is NOT typical of someone who just prefers to be alone. We are far to quick to slap labels on people who walk a little different path than we do. 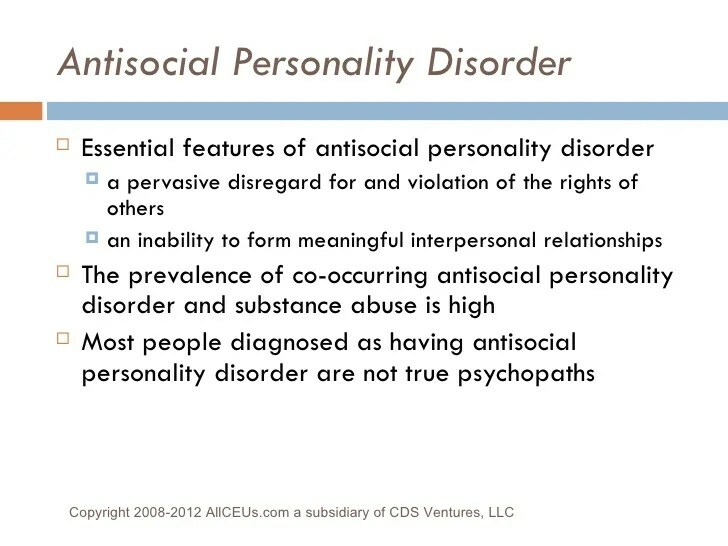 Someone who has Antisocial Personality Disorder may disguise it well, depending on basic temperament, but typically this person really doesn’t care too much how he is perceived. Lying is his primary MO, and he feels no remorse whatsoever in lying. If he is confronted, he will either charm his way out of it or he will shrug and walk away. His philosophy is that other people exist to help him get what he wants; to take care of him, and to make no demands on him whatsoever. He cannot truly love. As a matter of fact, this person could easily be considered sociopathic. There is just no concern at all about the effects of his behavior. He was probably a very difficult child, angry and maybe violent. This is a young person who will not hesitate to physically attack a parent or a sibling, and he can be a bully with his peers if he is strong enough to pull it off. He has very little fear. Some refer to this disorder as The Cold and Callous Man. Not that all people with Antisocial PD are men, but it does seem that there are more men than women who fall into this category. Treatment is difficult. There is no permanent cure, although if the person can be reached with the gospel, there can be a huge improvement. If the person will agree to treatment, there are several approaches that can be tried. You can go here for a comprehensive article about treatment for ASPD. Sadly, the person most often refuses treatment, blaming everyone else but never himself for the situations his behavior creates. Next week: The very interesting Borderline Personality Disorder.